Slow whisks in the mixing bowl. Sizzling butter with nutty aromas. Quiet mashing of ripened bananas. Late at night, while the kids are asleep and the husband is out, this is my little “me time” indulgence. I bake banana bread. It is my quiet time. My Zen place. After a long day of constant movement, noise, and people, baking bread in silence and solitude is water to my thirsty soul. And truly, this is a banana bread that is packed with deliciousness. Buttery, sweet, and a kick of rum. With sweet chocolate and toasted coconut. Holy cow. Trust me, the extra step of browning the butter is totally worth it – the result is a richer flavor that pairs so well with the rum. I used Malibu coconut rum, but I actually recommend dark rum, which is more robust. Steve and I ate this up in two days, keeping it a complete secret from our kids. It was that good. 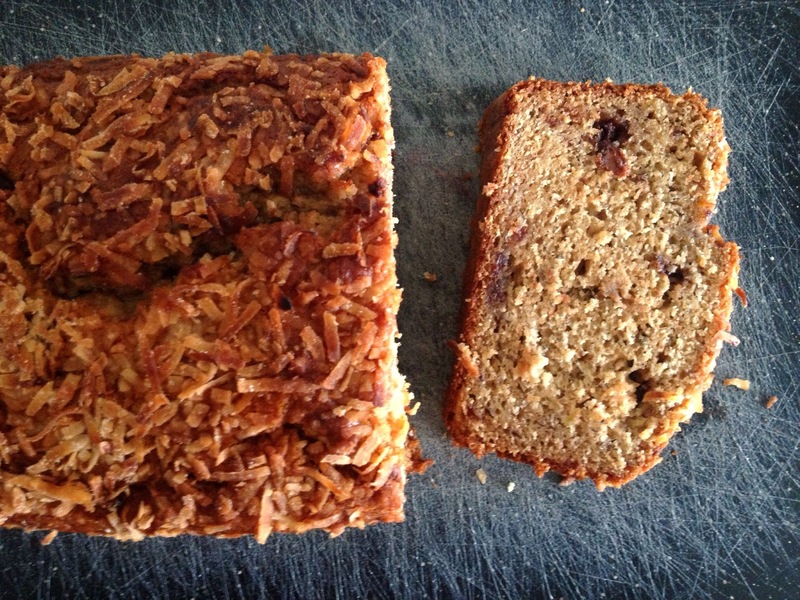 After having this banana bread, I don’t know if I can go back to regular old banana bread. You ruined me, amazing banana bread. Place a rack in the center of the oven and preheat to 350 degrees. Grease and flour a 9×5-inch loaf pan and set aside. Melt butter in a saucepan over medium heat. Butter will begin to foam and crackle as it melts. When the crackling subsides, the butter will begin to brown. Swirl the pan as the butter cooks. When the butter browns and begins to smell nutty, remove the pan from the flame and transfer the butter to a small bowl. Taking the butter out of the hot saucepan will stop the butter from overcooking and burning. Set aside to cool. In a large bowl, whisk together flour, sugar, baking soda, salt, and cinnamon. In a medium bowl, whisk together eggs, vanilla extract, rum, and yogurt or buttermilk. Whisk in the mashed bananas. When butter has cooled, whisk in the browned butter. Add the wet ingredients, all at once to the dry ingredients. Fold together, making sure to scrape the bottom of the bowl to reveal any hidden pockets of flour. Fold in the chocolate chips. Fold together ingredients, but try not to over stir. Spoon batter into prepared pan and top with untoasted coconut. Bake for 50 minutes to 1 hour, or until a toothpick inserted into the center of the loaf comes out clean. Remove from the oven and allow to rest in the pan for 15 minutes, before inverting onto a wire rack to cool completely. Bread will last 4 days, well wrapped at room temperature. This loaf also freezes well.